A picture of the late Paula West on display at the scholarship awards banquet, April 29, 2016. 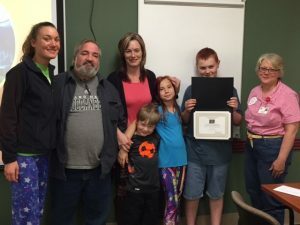 This spring, the Allegan General Hospital (AGH) Foundation awarded its first ever Paula West Therapeutic Riding Scholarship to 12 year old Kent Zoet of Gobles and 9 year old Skyler Hilton of Otsego during a scholarship awards banquet held at Allegan General Hospital. The Paula West Therapeutic Riding Scholarship is a new scholarship for the AGH Foundation. 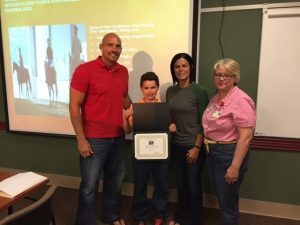 The scholarship was established in 2015 in memory of the late Paula West, an employee of Allegan Healthcare Group, after she passed away in May 2015 following an equestrian accident. 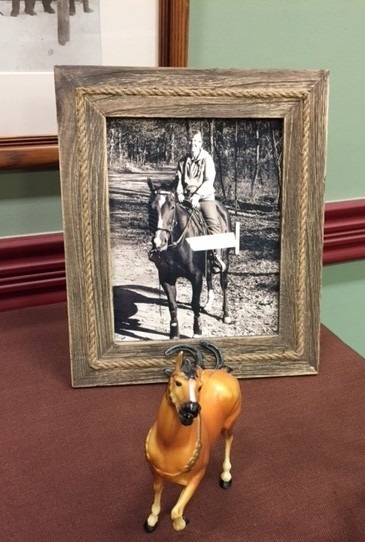 Paula was an avid horse lover and her friends and family wanted to do something to create a lasting legacy that also represented Paula’s passion for the equestrian world. The mission for the Paula West Therapeutic Riding Scholarship fund is to improve the emotional and physical well-being of special needs individuals through the therapeutic use of horses, which is not a benefit normally covered by insurance. AGH Foundation has partnered with world-renowned Cheff Therapeutic Riding Center located in Augusta, Michigan to offer scholarship sponsored sessions to children and young adults from ages 2 to 21, per scholarship guidelines. “Awarding these two scholarships was such a rewarding experience and a wonderful way to remember Paula. I am beyond grateful to Paula’s dedicated friends and family for establishing this scholarship fund. Children and families will benefit from world-class therapeutic riding sessions for years to come,” stated Jenifer Garcia, Executive Director for the AGH Foundation. “Paula’s friend and co-worker, Terri Sakal-Brockway, was essential to the startup of this fund. She put in many hours building the scholarship guidelines, searching for the “right-fit” riding center, and forming a dedicated scholarship committee. We are very thankful for Terri’s devotion” added Garcia. Scholarship applications and guidelines are available on the AGH Foundation website (www.aghfoundation.org) and can also be made available by contacting the AGH Foundation directly at (269) 686-4234 or jenifergarcia@aghosp.com. 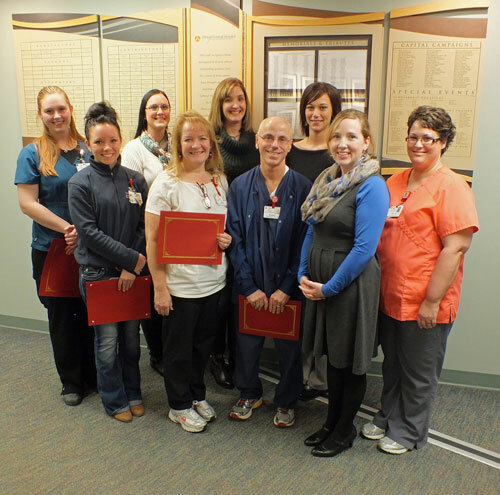 Two scholarships will continue to be awarded each spring. If you are interested in making a gift to support the Paula West Therapeutic Riding Scholarship Fund, please contact Jenifer Garcia at (269) 686-4234. Skyler Hilton accepts his award with his parents and Terri Sakal-Brockway, Allegan Healthcare Group. Kent Zoet accepts his award with his family and Terri Sakal-Brockway, Allegan Healthcare Group.